Neak Pean was the strangest and creepiest of the temples we visited during our time in Siem Reap. Situated in the middle of the Jayatadaka (the reservoir that served the then capital city), the temple was on an island once upon a time. Today, a wooden walkway leads from the main road to the temple across the long-dead reservoir. Neak Pean has a strange layout - the central shrine is in the middle of a pond, and has four shrines around it. 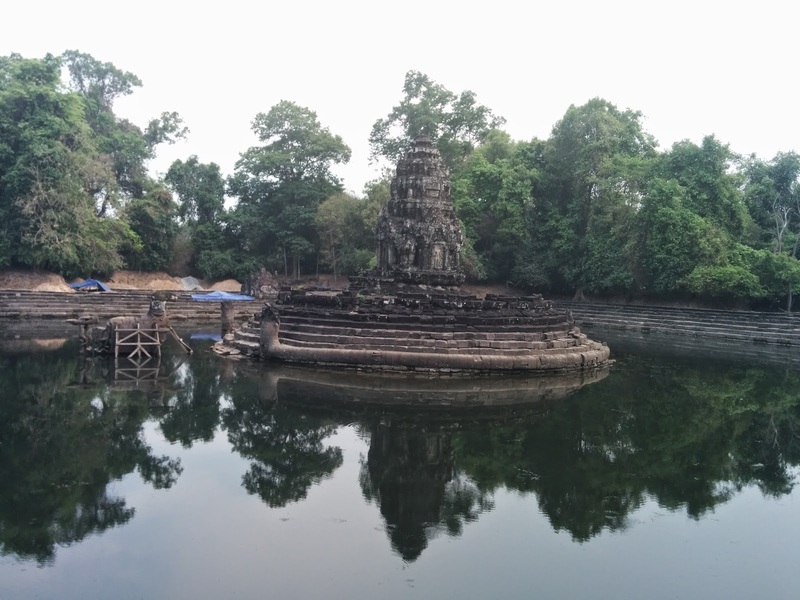 Its base has two entwined nagas, which give the temple its modern name (Neak Pean literally means 'entwined snakes'). Each of the subsidiary shrines also has its own pond. A miniature horse rises up from the water near the eastern door of the central shrine. Today, a fence bars access to the central pond and shrine. But I had no wish to go closer. I found the entire place silent and creepy - the silent forest, the green and still water, the inaccessible central shrine. I would love to visit there just to feel how truly eerie it is! SJP - Oh, you should!